Since sometimes that foreboding dinner party can be like a battlefront, Prada appropriately prepares you for war. 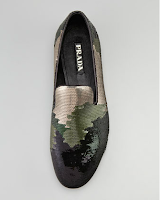 Their Camouflage Evening Sequin Loafer is a chic handling of the masculine print for a more civilized bunch of warmongers. 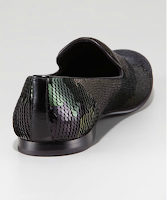 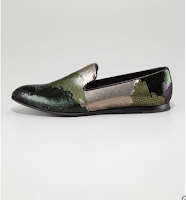 The upper is fully sequined in a camo motif with a leather lining and will add a bit of dashing familiar cool to any tux or New Year's ensemble. 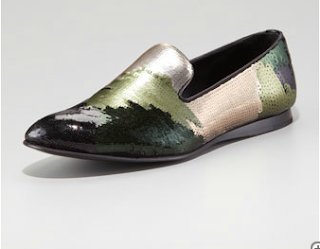 Made in Italy from a trusted name in Italian luxury and available now at Bergdorf Goodman and their website.